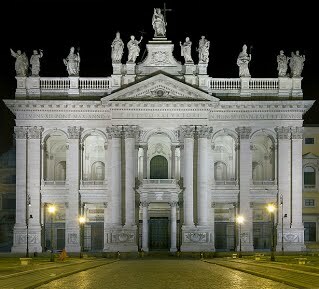 Feast of the Dedication of the Lateran Basilica, Rome - My Catholic Life! A church’s walls do not make one a Christian, of course. But a church has walls nonetheless. Walls, borders, and lines delimit the sacred from the profane. A house makes a family feel like one, a sacred place where parents and children merge into a household. A church structurally embodies supernatural mysteries and is a sacred space where sacred actions make Christians unite as God’s family. Walls matter. Churches matter. Sacred spaces and places matter. Today the Church commemorates a uniquely sacred space, the oldest of the four major basilicas of the city of Rome. The Lateran Basilica is the Cathedral of the Archdiocese of Rome and thus the seat of the Pope as Bishop of Rome. A basilica is like a church which has been made a monsignor. Basilicas have certain spiritual, historical, or architectural features by which they earn their special designation. As an architectural form, a basilica is a large, multi-naved hall built for public gatherings. When Christianity was legalized, its faithful spilled out of their crowded house-churches and into the biggest spaces then available, the basilicas of Rome. If Christians had met in arenas, then that word would have been adopted for ecclesial usage instead of basilica. The Laterani were an ancient Roman noble family whose members served several roman emperors. The family built a palace carrying their name on a site which in the fourth century came into the possession of Emperor Constantine, who then turned it over to the bishop of Rome. An early pope enhanced and enlarged the basilica style palace into a large church, which became the oldest and most important papal church in the eternal city. The popes also began to personally reside in the renovated Lateran palace. By medieval times, the basilica was rededicated to Christ the Savior, Saint John the Baptist, and Saint John the Evangelist. The popes lived at the Lateran until the start of the Avignon papacy in present day France in 1309. With the papacy ensconced far away for seven decades, the Lateran Basilica was damaged by fires and deteriorated so sadly that, by the time the popes returned to Rome in 1377, they found it inadequate. An apostolic palace was eventually built next to Saint Peter’s Basilica on the Vatican hill and has been the seat of the popes ever since. The Lateran Basilica retains its venerable grandeur, despite now being a baroque edifice with only a few architectural traces of its ancient pedigree. Beautiful churches are like precious heirlooms passed down from one generation to the next in God’s family. Walls do not make us Christians, but walls do clarify that certain sacred rituals are practiced in certain sacred spaces and in no others. A family in its home. A judge in his court. A surgeon in his operating room. An actor on his stage. God on his altar. We come to God to show Him the respect He deserves. He is everywhere, yes, but He is not the same everywhere. And we are not the same everywhere either. We stand taller when we step onto His holy terrain. Heavenly Father, we praise You more worthily when we are surrounded by the holy images in Your holy churches. Through Your grace, inspire us to render You due homage in the houses of God where Your presence burns brighter and hotter than anywhere else.